Nova Scotia’s Sustainable Fish Farming is shipping its first land-raised salmon to restaurants, a move supported by environmentalists. 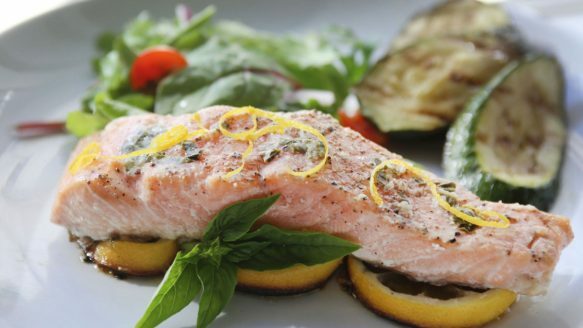 Research indicates there is demand for up to 40,000 tonnes of land-produced salmon in North America every year. HALIFAX—A Nova Scotia company has succeeded in raising Atlantic salmon in a fish farm on dry land, and environmentalists are urging government to support and promote the fledgling technology in a market currently dominated by larger ocean-based operations. This week, Sustainable Fish Farming is shipping its first fish under the brand name Sustainable Blue to stores and restaurants across the province. It’s a major breakthrough for the Centre Burlington company, which has been developing a closed containment system using salt water for the past eight years at its facility near the Bay of Fundy. “They’ve really cracked it for Atlantic salmon,” said Rob Johnson, the sustainable seafood co-ordinator for the Halifax-based Ecology Action Centre. Johnson describes Atlantic salmon as the “Holy Grail” of sustainable seafood because the market is dominated by fish raised in open-net ocean pens or cages. He says Sustainable Blue is notable because the company has proprietary technology that’s been demonstrated to work, defying an industry that has long questioned the commercial viability of land-based farms. “Government would be well advised to be supportive of leading edge technology ... to really aid in the development, commercialization and distribution of this technology,” he said. Reached in Toronto, where he was exploring a market opportunity with a restaurant group, CEO Kirk Havercroft said his company has received financial help in the form of repayable loans from the Atlantic Canada Opportunities Agency and the province. But he said land-based producers overall should get more support. Havercroft said his company’s research indicates there is demand for up to 40,000 tonnes per year of land-produced salmon in North America. Little supply is available Havercroft said, adding his company is currently able to produce 100 tonnes per year and is working to expand to 165 tonnes by next spring. Despite what’s seen as a potential technological edge because it produces salt water fish, Sustainable Blue is not the only company providing consumers with land-raised Atlantic salmon. An economic initiative by the Namgis First Nation in British Columbia has been supplying Canadian and U.S. markets since April 2014 with fish under the brand name Kuterra. Johnson said the Danish company Atlantic Sapphire is also poised for production this fall and another Nova Scotia company, Canaqua Seafoods, which has successfully farmed Arctic char and halibut, is working with Atlantic salmon as well. Matthew Abbott, of the Conservation Council of New Brunswick, said it takes effort to get closed containment farms off the ground and there is at least room for support through government regulations. New regulations for Nova Scotia’s aquaculture industry are expected to be released next month. They will include the process for licensing aquaculture operations said Keith Colwell, Nova Scotia’s Minister of Fisheries and Aquaculture. “A closed containment facility is going to be a whole lot easier to attain than, for instance, if you are going to set up an ocean pen-fish operation,” said Colwell, although he didn’t reveal details.